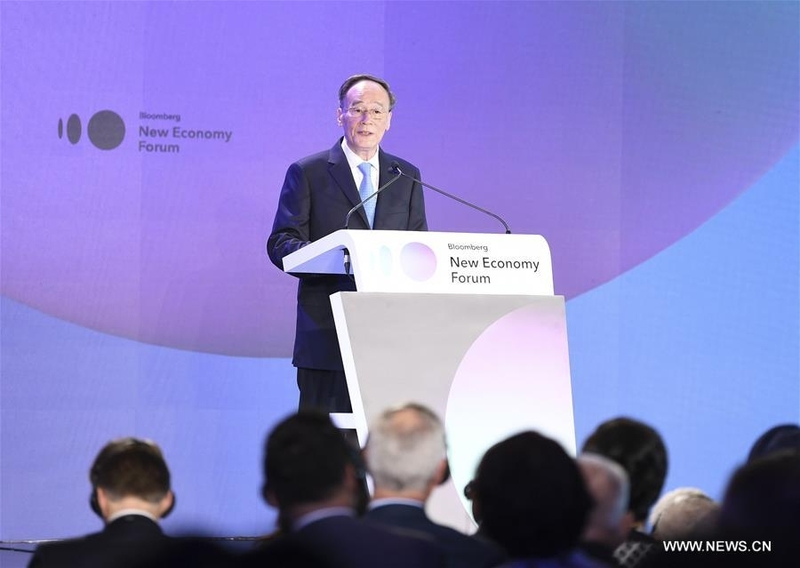 Chinese Vice President Wang Qishan advocated reform, innovation and common development at the New Economy Forum, which gathered about 400 prominent political and business leaders here on Tuesday. Wang also called on people to understand China's history, saying that the Chinese civilization, which witnessed pains and glory, determined that China can only take a development path with its own characteristics. He emphasized that China is still a large developing country, and it will persist in managing its own affairs and carrying out the new development concept. Wang said that China-U.S. cooperation leads to win-win results while conflict ends up with a loss for both sides and will directly affect world development and stability. He said that economy and trade cooperation is still a ballast stone and propeller for the healthy and stable China-U.S. relations. And the essence of the cooperation should be mutual benefit and win-win. China is willing to conduct consultations with the U.S. side on issues of common concern, and promote bilateral economy and trade issues to reach a mutually acceptable plan.